-----The Mobile and Alabama Rivers, plus Mobile Bay, make up the western arm of The Great Horseshoe route through the rivers and bays of southern Alabama. 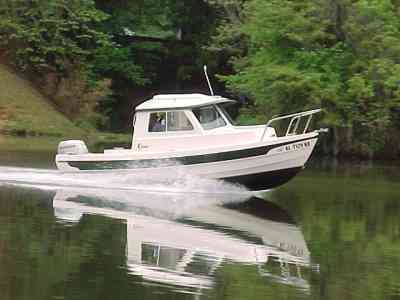 -----You can launch into Mobile Bay at marinas or into the Alabama River at Roland Cooper State Park. 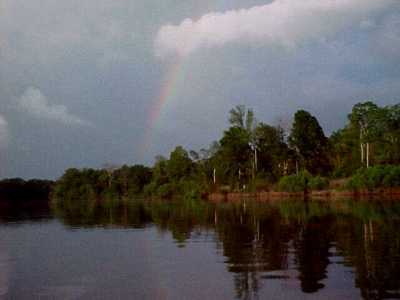 -----The Mobile River flows southerly into Mobile Bay, where it forms a large delta. Looking at the chart, as we came up to Mobile from the south, there is a wonderful confusion of anastomosing streams, canals, and inlets through the delta. The route north up the Mobile River is, however, easy to determine. The city of Mobile was built on the westerly of the channels through the delta, so one simply follows the ship buoyage into the city, go past all the docks, and keep going north. 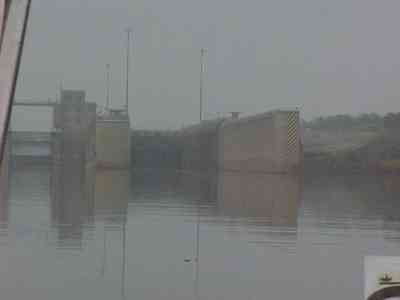 The river has active barge traffic, being the end of the Tenn-Tom Waterway. The buoys can guide you all the way to Kentucky and beyond. -----However, there is the temptation to explore the delta. So many choices. The alternatives cast a siren spell with names that have a haunting appeal to the nomadic boater - Tensaw River, Apalachee River, Spanish River, Polecat Bay, Chocolotta Bay, Pass Picuda, Game Warden's Ditch, Bay Minette, Chickasaw Creek, Chuckfee Bay, Raft River, Big Bayou Canot, Little Bateau Bay. There's plenty of water to poke around in and many stories to read. Why, the last great battle of the Civil War was fought there in the delta. In fact, it was actually fought after Lee's surrender and the war was over - but news traveled slowly then, and many men died. 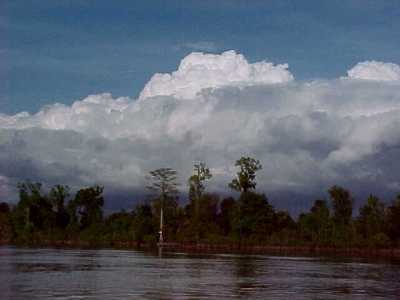 -----The clouds were gathering, however, as we started our cruise through the delta. NOAA was calling for thunderstorms, "some possibly severe, with damaging lightning, high winds, and large hail." 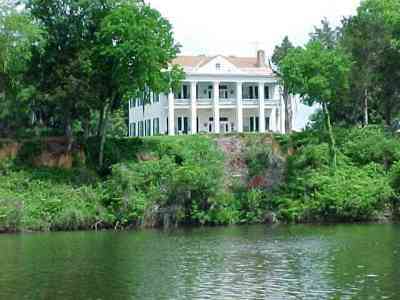 Temptation resisted, we pushed on up the Mobile River to the junction with the Alabama River. We passed a southbound tow pushing a barge full of logs. -----"How's the water level up the Alabama, sir?" El asked. -----"Oh, should be enough to float your little boat, ma'am," came the answer. -----That was the beginning of a nice chat between El and the tow captain. He let us know that there were "precious few" tows still on the Alabama. They formerly hauled gravel, coal, and fuel oil but the "traffic is down to a trickle" the skipper said, with a hint of nostalgia in his voice. 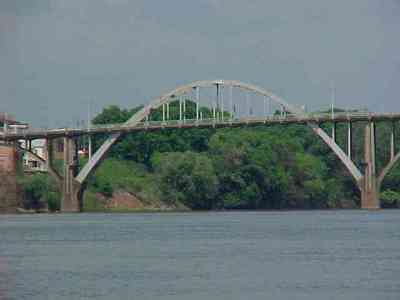 -----El asked if there was any fuel along the river. We left Mobile with full tanks, but it's a long way up to the first indicated marina on our charts. "No, ma'am. Mighty lonely up that lil' river. Not much of nothing up that way. Maybe ask at the first lock. You all be careful. You hear, ma'am - you all be careful!" -----We weren't sure what he wanted us to be careful of, and we were afraid to ask, so we parted ways - and we were careful. -----We were some 46 miles above Mobile when we took the right fork at the junction of the two rivers. 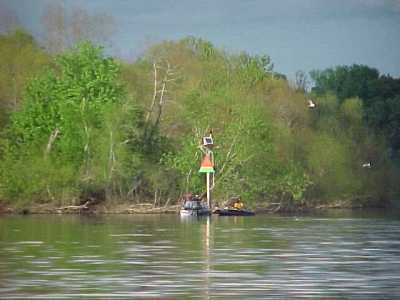 Our charts indicated another 134 river miles on the Alabama to reach the first marina with gas. Our range, with twin Honda 40's, and our 40 gallon tanks, is 170 miles. This is, however, on flat water, and we had a 2k current against us. Even for the mathematically challenged, it was obvious we weren't going to make it..
-----We weren't concerned, though, since our river guide gave a telephone number to call at the first lock, 72 miles upstream. A local chap brings fuel down to the lock for a minimum charge, said the book. There was a tone of confidence in that statement - that should have set off a warning bell. -----However, it didn't and we slept well in an oxbow off the river that night. -----The next morning it was beautiful along the river. 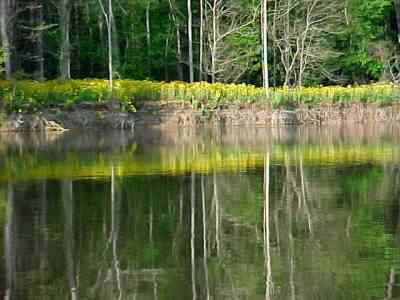 The banks glowed yellow with spring flowers. Navigation required full attention, however. There were drifting logs as large as our boat and numerous wing dams placed in the river by the Corps of Engineers to concentrate the river flow and scour the channel. The dams were set at right angles to the river and marked by navigation marks. Spring floods, however, had swept away some of the marks so it was necessary to study the flow of the river to be certain we didn't strike a dam. 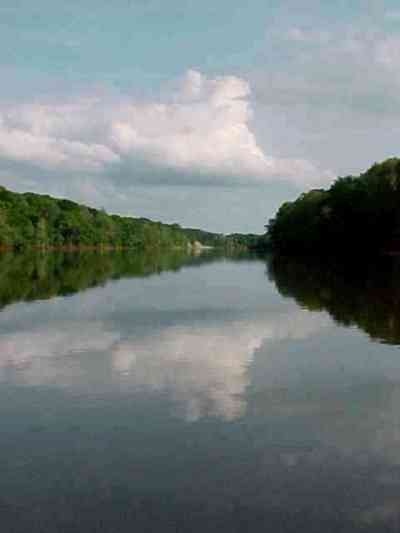 -----We arrived at the first lock, and dutifully called the number to have the necessary gas delivered to the river for us -- disconnected! Panic slowly rose in our chests. This is one lonely river, and we had seen only a few fishermen since leaving Mobile. No towns, no houses - nothing but Alabama forests and alligators. El radioed the lock operator and explained our situation. -----"Dun' know, ma'am. No gas here. Next gas is above the next lock at Sand Creek." -----"We can't make it that far on our fuel," El answered. "Is there anything near here?" 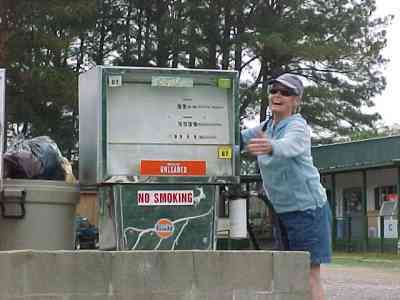 -----"No, ma'am -- nuthin'..." There was a long pause, then "Dun' know, ma'am..." Finally, he answered, "Maybe you cud ask at de campground 'bove the lock -- maybe... Dun' know, ma'am." 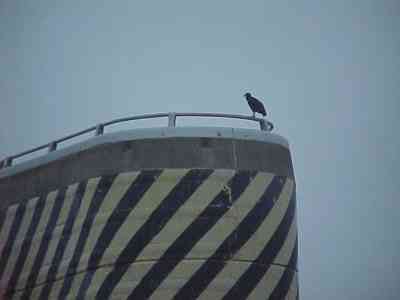 -----When we pulled up to the lock door we could see that there wasn't much traffic on this river. It was covered with greenery. -----We locked through, and the lock tender gave us a happy wave as we headed north toward oblivion. There was no choice. We stopped along the bank and walked up to the campground. Fortunately, Garland Smith had a few gallons in the tank of his bass boat and he had a four-stroke engine so it was oil-free. I was standing along the bank, knee-deep in vegetation-clad water, draining his spare fuel into our tank when Garland mentioned absently, "... alligators and snakes." -----El jumped a foot. "ALLIGATORS AND SNAKES?" -----He mumbled, "Well, the alligators probably won't bite, but the moccasins can be pretty thick along here and they're mighty territorial and aggressive. Why, just this morning my wife shooed one off our site.."
-----Never has a tank of gas been poured so quickly into a boat. I scrambled up the bank, paid him a few dollars for his extra gas, and climbed back aboard with a sigh of relief. -----Now all we had to worry about is whether it would be enough gas to get us to Sand Creek. -----We ran out of daylight before we ran out of fuel. 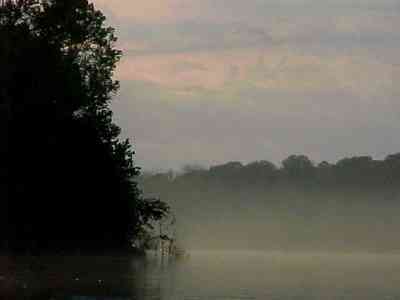 We hooked along the bank of the river just eight miles below the lock, and nine miles below Sand Creek. We had seen only one boat since leaving Garland. -----The next morning, it was foggy and still. We pulled the hook and continued up river with only one engine running. Within a mile, it quit. 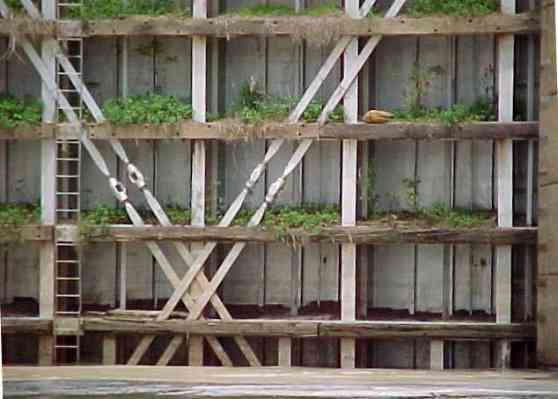 That tank was drained. We dropped the other engine, and slowly chugged up against the current. Our GPS counted down the tenths of miles and the minutes to our destination - it seemed interminable. Finally, through the mist we spotted the lock. El radioed to have the door open for us, warning that we didn't have a drop of gas to spare. The door was open, and there, on the right abutment, sat the waiting committee. 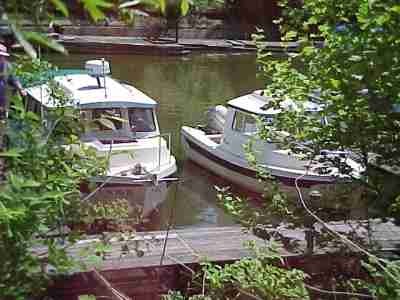 -----Well, we made it into Sand Creek Marina -- and we'll never know why. We have two twenty-gallon tanks and we took 43.5 gallons of gas! 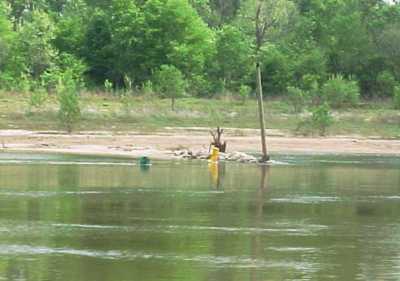 -----Tanks full, we could again relax and enjoy the river. Now, in the upper stretches, there were towns, houses, boat ramps, and state parks. This is a river that is saturated with history -- and some of the events, we're old enough to remember. 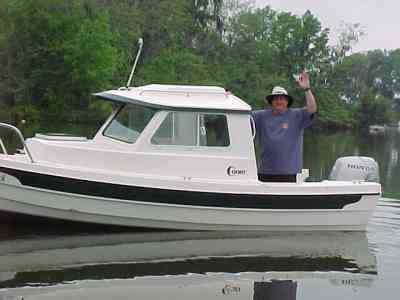 -----Pat Byrd is a 'Bama C-Dory owner. He was a great help for us in planning our 820 km "Grand Horseshoe" trip on the Alabama Rivers. He loaned us all the charts he had and volunteered to drive us back to our starting point to pick up our truck and trailer. -----We had been staying in touch with Pat by e-mail or cell phone on our journey, and when we locked up the last lock and were a day out of Montgomery, we called to let him know all was well and we were almost 'home.' He decided to take the day off, get in his 16' Jabez and join us for the last miles. Being the adventurous type, Pat came down river in the dark to meet us at our anchorage 31 miles below town. 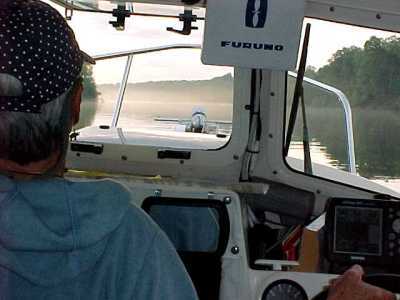 We 'homed' in using the VHF and a spotlight, shared an evening on the river, and headed to Montgomery the next day. We shared a beer at the Montgomery Marina -- we had cruised every mile of Alabama's 1,428 miles of navigable river -- and loved it!. Pat, on Jabez 								Jabez is a beaut, eh?